I started the first round of the fall garden veggies last night. Broccoli, cauliflower, cabbage and brussel sprouts started indoor, out of the heat since they do better in cooler temperatures. I’ll direct sow lettuce and beans later this week or next. 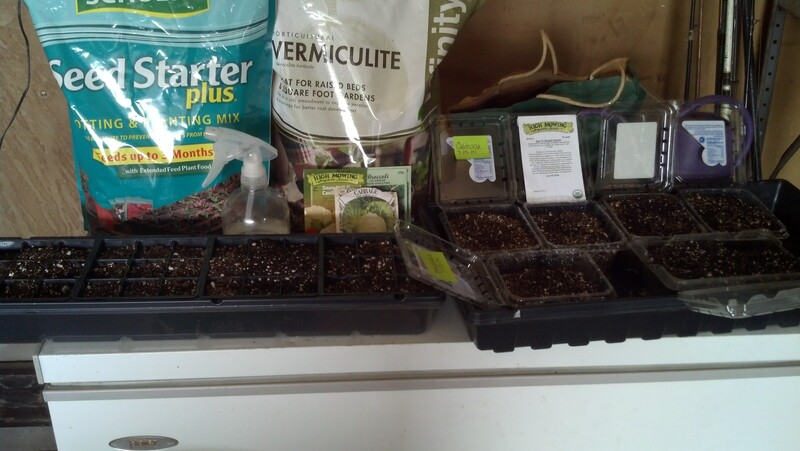 Broccoli and cauliflower in the seed starting pods and cabbage and brussel sprouts in the berry containers. Excellent for drainage. Right now, you can find awesome deals on seed packets. I got my cabbage, broccoli, lettuce and peas for 10 cents per pack! I’m only planting bush beans for the fall garden. I just don’t feel that the pole beans are doing all that well, and I want to be sure to have a good harvest for canning. I put a spreadsheet together to keep me organized for the fall planting. You’ll notice that some of the plants are repeated. This is in order to have a weekly harvest of lettuce and spinach for as long as possible into the season. Why, you may be asking, am I waiting until October to plant the garlic. Well, as I mentioned in a previous post, I will just plain old have more time to devote to preparing the cloves correctly. Also, garlic can overwinter and fall planted garlic will produce bigger bulbs of yumminess.